A dry cider that has matured over the winter in an oak barrel. A medium dry cider named after Fran’s father who enjoyed cider for most of his ninety-three years. 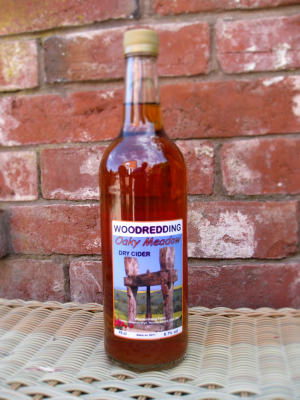 A single variety medium sweet cider made from the Yarlington Mill cider apple. In 2013 this has been judged Supreme Champion Cider at the Royal Bath and West Show and Best Cider from Herefordshire at the Royal Three Counties Show. A medium Perry made from the Winnal’s Longdon variety of perry pear that originated in the nearby Herefordshire village of Weston-under-Penyard. After pressing the cider apples we were just short of a full barrel and topped it up with juice from perry pears. The result is a very pleasant and refreshing drink that is named in celebration of our successful year in cider competitions.